The Graduated Full Persian with Crystals Necklace has a line of crystals inside the middle section of the necklace. It adds a nice touch of color to the jewelry. 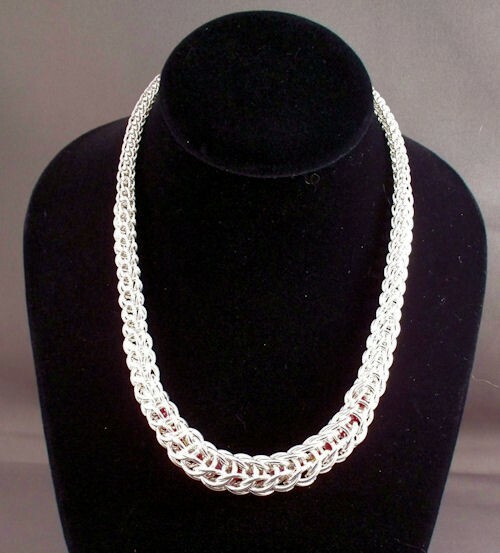 It is constructed of different ring sizes that smoothly transition in size along the length of the necklace. It is 18 inches in length but you can purchase additional two inch kits for additional length if you want. This is an intermediate weave. The crystals are not supplied in the kit. A sterling silver or yellow gold filled balloon clasp is included in the kit.